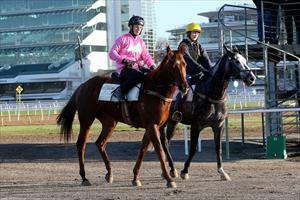 Outback Warrior and War Legend represent the stable at Sandown on the Lakeside course on Wednesday. Outback Warrior (pictured) runs in race three, the Le Pine Funerals Handicap (1200m) for three-year-olds and will be ridden by Jordan Childs.. The three-year-old son of Toorak Toff was an impressive winner on debut over 1200m at Geelong on June 26, drawing away in the home straight to score by 3-1/4 lengths on the synthetic track. “He’s trained on really well and I’m happy with him,” Moroney said. “I haven’t done too much with him as it’s a relatively quick back-up. “He did a few things wrong on debut, just wanted to over-race early and then when he got to the front he wasn’t quite sure how to finish it off. “There are some promising looking lightly raced horses in the race but if he takes the experience of the race then I’m confident he is a winning chance. War Legend runs in race seven, the Clanbrooke Racing Handicap over 1600m with Lachlan King to ride and reduce his weight to 56kg. This will be the fourth run this campaign for the five-year-old who finished third last start over 1600m on a heavy track at Bendigo on June 17. “He’s drawn out a bit awkwardly but there are a few scratchings so he’ll jump from eight in a field of 13,” Moroney said. “I’m happy with his level of fitness and it looks a decent enough race.